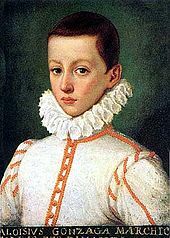 Aloysius returned to Castiglione where he met Cardinal Charles Borromeo, and from him received First Communion on 22 July 1580. After reading a book about Jesuit missionaries in India, Aloysius felt strongly that he wanted to become a missionary. 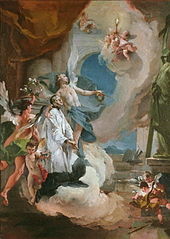 He started practicing by teaching catechism classes to young boys in Castiglione in the summers. He also repeatedly visited the houses of the Capuchin friars and the Barnabites located in Casale Monferrato, the capital of the Gonzaga-ruled Duchy of Montferrat where the family spent the winter. He also adopted an ascetic lifestyle. Several buildings and institutions in Spokane, Washington, are named after Gonzaga. 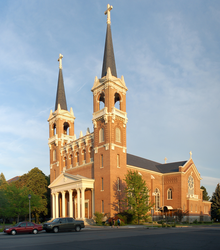 Gonzaga University is a Roman Catholic university which also has St. Aloysius Gonzaga Church on its campus, which is overseen by the diocese of Spokane. Gonzaga Preparatory School is a private, Roman Catholic high school. Finally, St. Aloysius Gonzaga Catholic School is a K-8 school. In Washington, D.C., Gonzaga College High School: Washington Seminary, as Gonzaga was originally called, began classes for lay students in 1821 and was renamed Gonzaga College. Gonzaga College High School is a Catholic college preparatory school for boys in grades 9–12. St. Aloysius Gonzaga Church on the campus of Gonzaga High School in Washington, D.C., is used for graduation ceremonies of the high school. It had been an operating parish church until 2016. When the church was dedicated in 1859, The New York Times wrote, "In internal architectural beauty, it is said not to be surpassed by any church in the world." ^ a b c O'Conor, John Francis Xavier (1907). 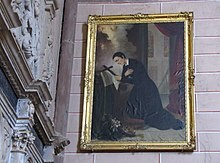 St. Aloysius Gonzaga. The Catholic Encyclopedia. Vol. 1. New York: Robert Appleton Company.